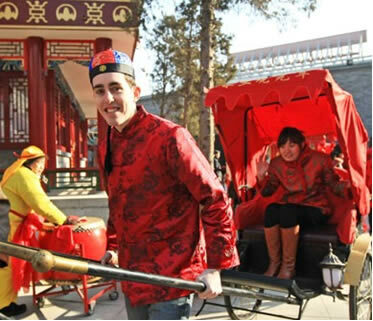 Special Experience: by rickshaw and battery car in turn, discover the traces of old Beijing city and the according Beijingers’ life. Be met our private English-speaking tour guide at the check point at Shichahai area. Visit the Silver Ingot Bridge (Yinding Bridge), the old Hutong alleys, the courtyard residence, and then comes to the Houhai Lake area. Appreciate the beautiful lake scenery and also the characteristic bars along the lakeshore. Change to the battery car to continue the trip. Out of Houhai Lake, pass by Liuyinjie Street, a dignified valley with well-preserved residence of ancient celebrities; Prince Gong’s Mansion is the most famous. Return to the starting point.